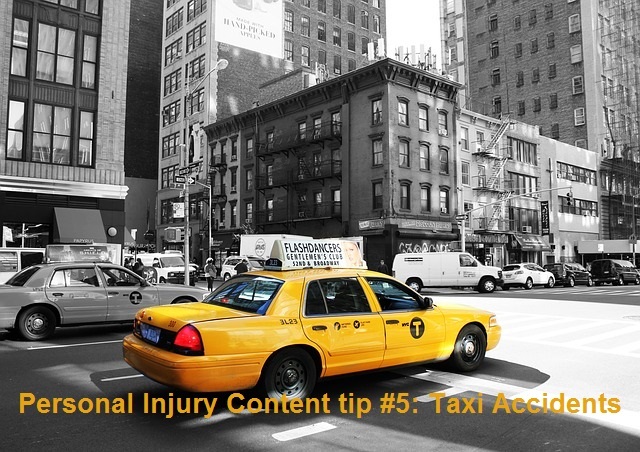 Don’t expect this one to make the phone ring off the hook overnight or anything but taxi and taxicabs are often overlooked keywords in any personal injury lawyer’s content portfolio. A good taxi accident page will help with all sorts of long tail search. Sure, there aren’t huge differences between a car accident case and a taxi accident case but people could search the Internet for more information if they have been injured as a passenger in a taxi, hit by a taxi or involved in an accident involving a taxicab. Time is money to these drivers who are often charging by the mile. In cities such as Los Angeles and San Fancisco taxi drivers have taken a HUGE hit in the last few years thanks to Lyft and Uber. As a final note, in some cities, such as cities in California, there may be special requirements which regulate taxicab operation. In other words, any driver can be negligent but a taxicab driver should especially be aware of their duty to care. A $26 million verdict against Yellow Cab was one of the highest verdicts of 2015.